Y’all know how I’ve been complaining about this fashion rut I’ve been in lately? Well, I was fortunately wrong. So very, very wrong. This weekend I went shopping, and 5 hours later…was the proud owner of more new clothes than I have ever bought at one time in my entire life. 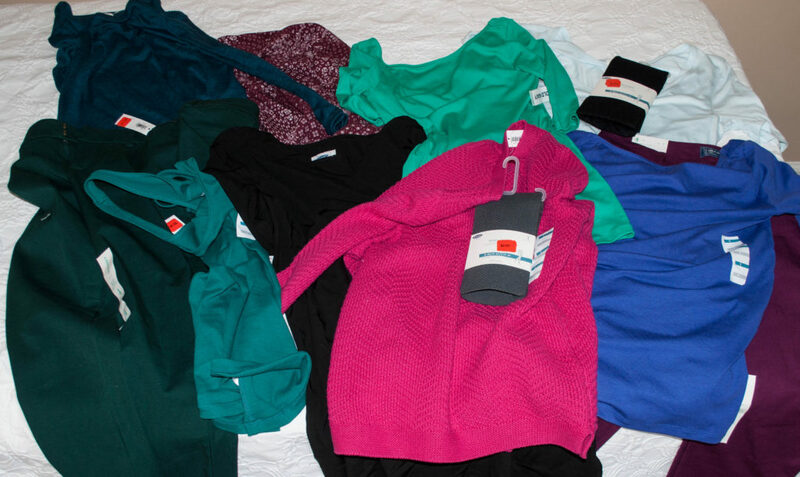 I ended up with 23 new items (well, 2 of them were tights, which don’t really count. So, 21 new items) and paid a grand total of $102.00. My highest average spent per item was in TJ Maxx. I have always liked TJ Maxx, but it’s hard to find true steals there, since they never run sales and put very few things on clearance. So, I paid full price for both the pair of pants and the off-the-shoulder (this will be a theme in today’s post) top I bought, for a grand total of $37 (all prices include tax, unless otherwise noted.). However, I forgot to take a picture of these. I think I’m still a LITTLE on the fence, because, well, they were full-price, and that doesn’t fit in with my DDS creed! Next highest total was at a consignment store. Y’all, this is why I so rarely shop at thrift/consignment stores. It’s only a little bit because I think thrift stores are dirty and smell bad and I don’t like the hunting through garbage aspect. It’s also very much because I can find new things for the same or less money. 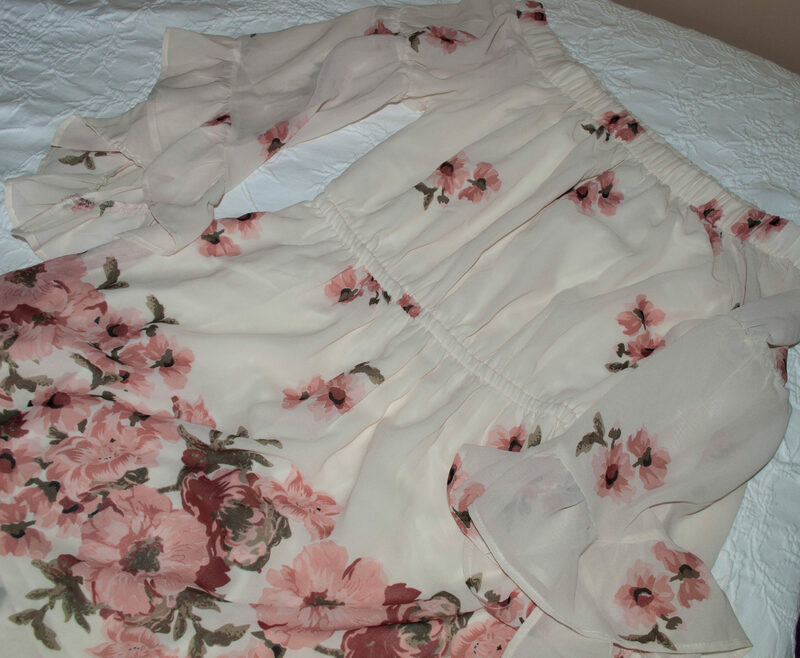 Nevertheless, the consignment store was my first stop before I knew I was going to hit pay dirt elsewhere, and I walked away with a cute dress, sweatshirt-top, and blouse for $33. Not bad. Next up is Ross. This is like the poor man’s version of TJ Maxx; literally, and figuratively. I’ve never seen so much emphasis on loss prevention than at Ross, where you are greeted by a security guard wearing a jacket that says, well, “Loss Prevention.” It’s not a pleasant shopping experience, but of the three big discount clothing stores – TJs, Marshalls, and Ross, I’ve found Ross to have the best dress (and sometimes shoe) collection. So, I go in there for those two departments alone. This time, I think I found my Easter dress. I’m still trying to decide if off-the-shoulder is appropriate for church (I’ll wear my hair down, and have a choir robe on most of the time…feel free to weigh in). It was $10.99 (plus tax). But here’s where it really starts getting good. I had a couple gift cards for JCPenney – one I knew had $25 on it; the other I’d recently found and could have had $2.93, for all I knew. Anyway, JCP had items on their deepest clearance level, PLUS an additional 25% off coupon. 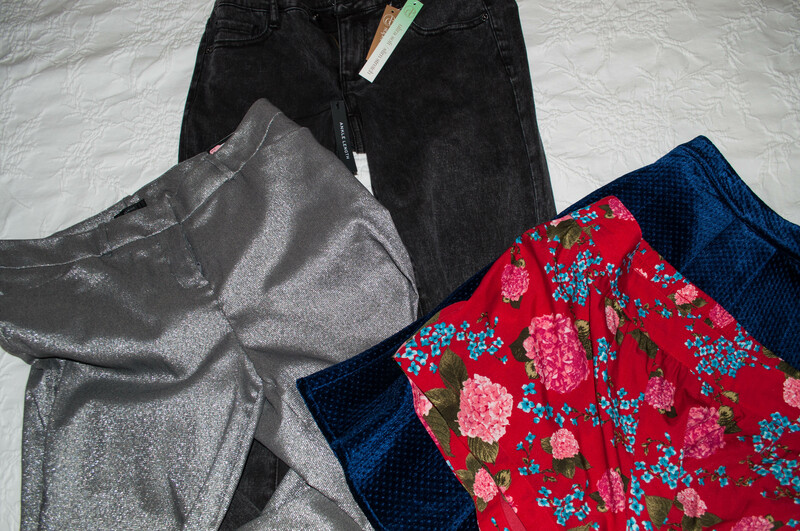 So, for $28, I got a skirt, two pairs of pants, and a pair of shorts. And, my other gift card also had $25, so not only were these items totally free for me, but I still have about $21 left over! And yes, those are silver pants. Because why not? And now for my shopping masterpiece, I present, Old Navy. 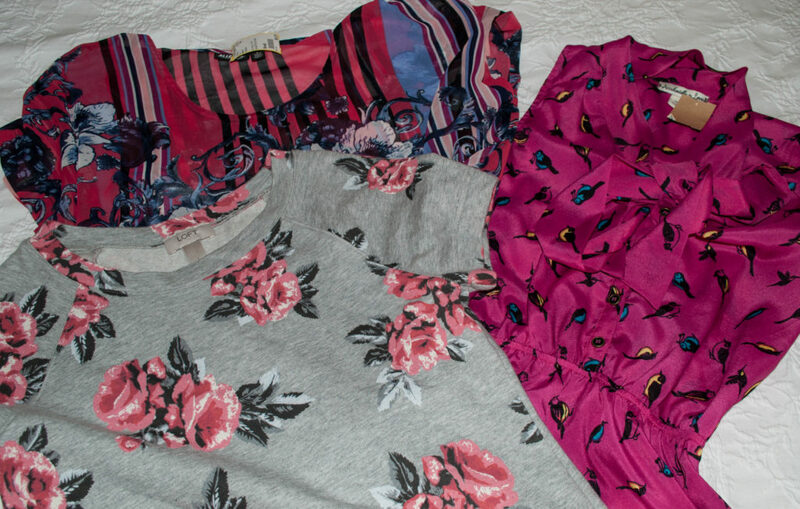 I know they’re cheap clothes, so to say I got good deals there is not probably as exciting as finding the rose-printed LOFT sweatershirt pictured above for $7. But, I will still revel in my victory. When I recently opened the Old Navy credit card, they immediately sent me an offer that if I used the card outside of their brand within the first 30 days, I’d receive a $30 rewards card. So, I did (and promptly paid it off, of course. Credit card companies probably don’t love me.). Then, a few weeks later, they sent another, similar offer. If I used the card twice outside of their brand, I would get $45 in rewards! So, I bought some gas and a water bottle, paid it off, and had $75 of Old Navy credit to my name. Well, thanks to the never-ending sales at Old Navy, as well as a very well-stocked clearance section, I struck gold. 2 pairs of pants, 2 dresses, 1 tank top, a sweater, 4 shirts, and 2 pairs of tights later (so, that’s 12 items), my bill came to about $98. By itself, that’s a pretty good deal for 12 items. But, after my rewards, the total I owed was $12 and some change. Y’all. Twelve dollars. That’s a dollar per item. For new clothing. My favorite part is that I almost bought that hot pink sweater when it was new and probably like 30% off. I would have paid $25-30 for it. Instead, I paid $3.47! Or, you know, nothing, depending on how you attribute those rewards. So…it was a good day. Also not pictured, the (also off-the-shoulder) blush, silky top I’d bought at Kohl’s earlier that day for $8. I don’t anticipate I’ll go shopping again anytime soon; my wardrobe has been completely revitalized, and my wheels are turning thinking of all of the new outfits I can create! So, maybe my mojo is back, after all. Let’s all hope. Are you a DDS? If so, what are some of your best finds? I get way too excited about good bargains (as evidenced by this very long post), so I’d love to hear your stories!